May 24, 2006 - X-Men: The Official Game won't spoil the plot of the upcoming movie. Events in the game take place between the last X-Men movie and this new sequel, X-Men: The Last Stand. However, it might spoil your appetite for superhero gaming for a while. In my space, nobody can hear me scream. However, in a crowded theater I'm sure everyone would get a good earful before security was called. And if the movie is anything like this game, scream I will. To tell you the truth, X-Men: The Official Game did not make me scream. Nor will it make you scream. It doesn't evoke enough passion or frustration to elicit such an explosive reaction. Like me, you might be more inclined to groan and whine with bitter disappointment - but at least not until the end of the game when you realize that the end is nigh it's not going to get any better. There are aspects of the game that are genuinely fun and challenging, but not enough to make the game memorable. They are sandwiched between epic episodes of mediocrity. There is a story here but it seems more like a documentary than a classic action-packed, superhero fantasy. It's not that the character treatment is steeped in reality, that's what makes the X-Men so appealing, it's more that the game focuses on the back history of the three principal characters as opposed to creating a new, memorable adventure for all of them. 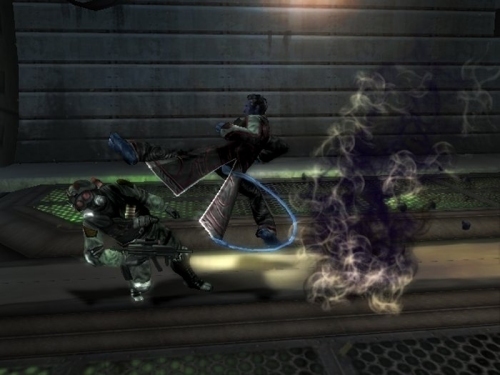 The three playable characters include Wolverine, Iceman and Nightcrawler. The story explains why Nightcrawler won't be in the upcoming movie. You'll learn more about Wolverine's past, as well as witness Iceman's coming-of-age as he becomes inducted into the X-Men organization. Nightcrawler is easily the most fun of all three characters to play. He's reminiscent of the Prince, from the Prince of Persia, in that he's a very flexible acrobat and skilled combatant. He also has the mutant power of teleportation which allows you to make him appear in some very inaccessible areas as well as reappear behind as enemy to launch a surprise attack. Wolverine is like a tank, and he's about as diverse as one. He's the most powerful of the bunch but he's a lot less flexible. In this game he's less maneuverable. He's more like The Thing from the Fantastic Four than the Wolverine of old. He has his claws to tear the enemy to shreds and a handful of repetitious combos. Wolverine is just not as much fun as he used to be. Iceman comes in second place on the fun factor. He too is limited with his skills but he's got the vehicle which adds a little more to his coolness factor. He gets around on a sheet of ice which he uses as a flying surfboard (Silver Surfer anyone)? His attacks are relegated to ice beams and ice particles in the form of hail which he shoots as projectiles. An ice shield is his main defense from enemy attacks, which are limited thanks to the less-than-aggressive AI. They just don't put up much of a fight. They really have to be shaken up before they get riled. Even at that they perform the same basic attack moves which are incredibly easy to counter after you've experienced a few of them. Not to mention that the average enemy is the same character model in slightly different uniforms. There are some self-imposed, arbitrary, time limits to some of the missions. This is typically an ill-conceived way to add some extra frustration to the gameplay by attempting to make things more challenging. This is the difference between a great game and an average game. A great game would have better AI programming comprise a larger portion of the challenge. Turing portions of the gameplay into an obstacle course or a race against time shows a lack of imagination by reverting to dated formulas. Having said that, I must give credit where credit is due. The boss fights, featuring such favorite evil villains as Magneto, Pyro and Sabretooth are incredibly well done. It's too bad that all the combat wasn't this engaging. 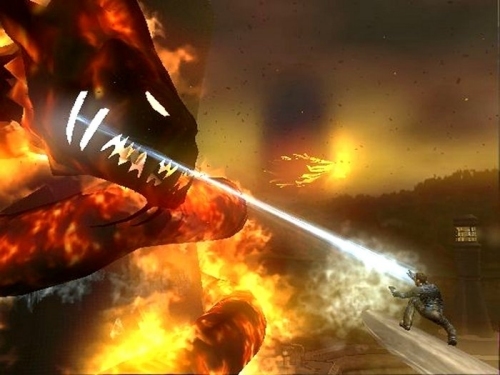 The boss battles are so good that they serve to illustrate just how much filler combat there is in the game. The bosses are very powerful and devious but they also have their vulnerabilities which you must exploit. I'm reminded of the battles between Spider-Man and the Green Goblin in the first Spider-Man game of the new series. The bosses don't have unfair advantages. While challenging, you actually feel as though you do have a change against them. You can try to use different techniques against them as opposed to just waiting for them to raise a hand and shoot them in the chest, or some other patterned moment of opportunity. Some light RPG elements have been included. Characters can earn upgrades by performing most of the tasks associated with clearing each level. You don't have to complete all of the tasks but the more that you do accomplish the more mutant upgrades you will receive. New move lists and abilities aren't part of the upgrades, they are more like power-ups. You can increase things such as the power of your attacks, health, your ability to heal faster and in the case of Iceman, better balance. Not to say these aren't useful but being stuck with the same skills and moves makes the gameplay drag through sheer repetition. Graphically speaking, you'll pay an extra $20 for the Xbox 360 HD version, which honestly doesn't look that much more impressive than the Xbox version which doesn't look that much better than the PS2 version - so tread wisely. Hugh Jackman delivers the voice of Wolverine once again (Alan Cummings voices Nightcrawler), and Patrick Stewart lends his dulcet tones to the professor. The actors' performances are stellar but it's just bad that they don't have very interesting things to say. I know this is based on a comic book movie but the dialog could be a lot more natural. It all seems forced, even the lighthearted moments. Everything considered, the gameplay, the graphics, the dialog, the music, make X-Men: The Official Game an officially average game. It could have been so much more and I'm not saying that because my expectations were high. I'm not an X-Men fanatic, I'm a videogame fanatic, and as such I just can't seem to get my claws into it. ·Become three legendary heroes - Players will immerse themselves in the signature powers of their favorite X-Men heroes -- hack and slash with Wolverine's brute strength to decimate foes; as Nightcrawler, players will scale walls, spin and BAMF through environments to stay one step ahead of enemies; and experience incredible speed on Iceman's ice slide while shooting ice beams and creating hailstorms to freeze the opposition. For even more power, players can utilize fury and adrenaline modes to launch devastating attacks. Experience events leading up to the X-Men: The Last Stand feature film and play beyond - Players will experience epic Super Hero action as the game explains Nightcrawler's mysterious absence from the movie, and in-game events foreshadow the roles of the X-Men and Brotherhood in the film. The game's climactic ending sets the stage for the movie with intersecting characters and storylines intersecting. Become a part of the X-Men movie universe - Embark on aglobe-spanning conflict that delivers every element of the X-men universe-from costumes and enemies to the voice of Patrick Stewart. Explore Alkali Lake, the Statue of Liberty, Dark Cerebro and more. Battle fierce enemies, join forces with X-Men comrades - Face off against villains from both the movie and beyond as favorite X-Men allies join forces with the player in gameplay that includes melee fighting, stealth-style action and time-based missions. Experience gameplay environments specifically designed to showcase each character's Super Hero abilities - Uniquely engineered environments empower players to use different gameplay strategies as they harness their Super Hero powers and defeat enemies. Players will have ultimate control over their heroes as they improve their superpowers over time through the Mutant Evolution System. Nothing terribly exciting. This looks like your typical 2003 PS2 game. Having three playable characters with different abilities is a huge plus but they don't have enough personal abilities to make them interesting. eclecticism. The voiceovers are excellent but the dialog is forced. There are plenty of unlockables, secret paths and alternate storylines for those that can't get enough of the game. Most people will get enough of the game the first time through. February 8, 2006 - Either showing a surprising amount of restraint or perhaps a lapse in judgement, Activision has not published a game based on the popular X-Men movies. Until now, that is. X-Men: The Official Movie Game (working title) is set for a May release to coincide with the X-Men movie threequel entitled: X-Men: The Last Stand. Penned by X-Men comic book writer extraordinaire Chris Claremont and Zak Penn (screenwriter for all three X-Men movies) X-Men: TOMG will act as a back-story for the upcoming feature film. Unlike the X-Men Legends RPG series in which players are given control over a multitude of merry mutants, X-Men: TOMG will feature three heroes: Nightcrawler, Ice-Man and....and....what's that other guys name...you know....the real popular one...Wolf-Man....no....Chuck Woolery....no....oh wait...Wolverine! Yeah, that guy. Bet you didn't see that one coming. For X-Men 2: United movie fans whom, much to their disappointment, already know Nightcrawler won't be appearing in the third movie, X-Men: TOMG is going to shed light on why the German-born blue-skinned acrobatic teleporter won't be involved in the onscreen antics with Angel, Beast, Storm, Wolvie and company. I thought it was because of actor Alan Cummings incessant whining in regards to the 4 hour Nightcrawler make-up process which resulted in Fox not picking up his option for the flick, but it turns out the answer is far more actiony! Cool! Sorry for the run on sentences there, but my Run-On Sentence Detector 3000 is in the repair shop....due to overuse. Since the 3 characters are fairly diverse in terms of abilities, players should get a well-rounded taste of mutant combat. Wolverine will cover the brute strengh category, eliminating foes with his adamantium butterknives he's been outfitted with. Bobby Drake (Aka Iceman) will shoot icebeams and create hailstorms while using his iceslide as a means of cool transportation. Please excuse the wickedly lame pun. Nightcrawler will finally be able to use his wallcrawling ability (ala Spider-Man) in a video game and will rely on his BAMFing teleportation and martial arts mastery to decimate foes silly enough to get in his way. If you're a little bummed that you won't be able to play as some of your other favorite characters, just pull yourself together and quit boo-hooing. Developer Z-Axis doesn't want to dillute the game with a plethora of playable characters which is far too ambitious a concept given the looming May deadline. The good news is you will be able to play alongside CPU controlled X-People, but currently that shortlist is Top Secret info. As an X-Men fan from wayback - I was a merry mutant fanclub cardholder before the world even knew of Logan, Ororo Munroe and Kurt Wagner...and they were introduced in 75! (but I still consider them the "new characters") - I'm always up for another playable X-Men adventure. I also harbor a healthy respect for Chris Claremont whom I stuck with through thick and thin during his tenure on the Uncanny X-Men back in the day. Activision has delivered some of the best superhero games ever created and we're hoping that X-Men: The Official Movie Game continues that tradition. Become three legendary heroes - Players will immerse themselves in the signature powers of their favorite X-Men heroes -- hack and slash with Wolverine's brute strength to decimate foes; as Nightcrawler, players will scale walls, spin and BAMF through environments to stay one step ahead of enemies; and experience incredible speed on Iceman's ice slide while shooting ice beams and creating hailstorms to freeze the opposition. For even more power, players can utilize fury and adrenaline modes to launch devastating attacks. Become a part of the X-Men movie universe - Embark on a globe-spanning conflict that delivers every element of the X-men universe-from costumes and enemies to the voice of Patrick Stewart. Explore Alkali Lake, the Statue of Liberty, Dark Cerebro and more. Game console features and exclusives - Experience the X-Men universe in amazing HD on the Xbox® 360 version of the game. The Game Boy® Advance and the Nintendo DS versions also offer exclusive X-Men characters to play, and for the first time, use the Nintendo DS touch screen to control the X-Men.